Mr Wolf’s Pancakes is a fun and amusing story to read in preparation for making pancakes on Tuesday. Mr Wolf is hungry and really fancies some pancakes. But will his fairytale neighbours help him to make them? 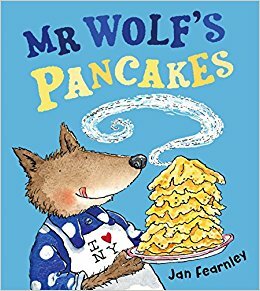 The Story: Mr Wolf has never made pancakes before. He asks his neighbours to help but they all refuse. Mr Wolf perseveres and reads the recipe, writes a shopping list and counts his money before making the pancakes. but when the neighbours smell them they all want to help him eat them. Mr Wolf invites them in but his unhelpful neighbours are in for a surprise! Nursery rhyme and fairytale characters including Wee Willy Winky, Little Red Riding Hood and The Gingerbread Man refuse to help Mr Wolf. However, despite reading, writing and counting difficulties, Mr Wolf perseveres with his plan and succeeds. By the end of the story we’re feeling huge respect and sympathy for him although when his neighbours come to visit he comes up with a solution that is not entirely unexpected for a fairytale wolf! There is wonderful humour in Jan Fearnley’s illustrations. The title of Mr Wolf’s recipe book makes us laugh and my daughter finds it funny that he tries to read it upside down. It’s fun to read the book titles on Mr Wolf’s bookcase and the signs on the shops with their references to various fairytale and nursery rhyme characters. We love the inclusion of the nursery rhyme and fairytale characters in the story and feel sorry for Mr Wolf when they don’t help him. Mr Wolf’s Pancakes often leads to discussions about why the neighbours didn’t help and what we would have done in Mr Wolf’s position. Would we have let the neighbours in to eat our pancakes even though they hadn’t helped us? This is a great story to use in the classroom as part of a topic on food. 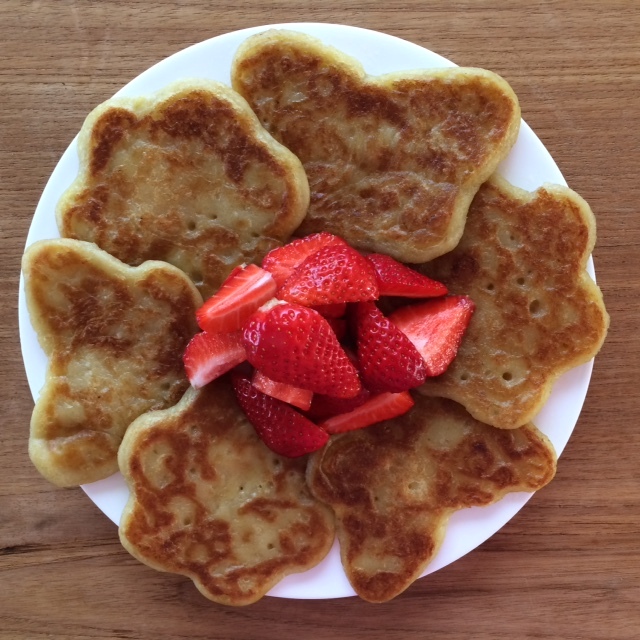 Children can be encouraged to read pancake recipes, write their own recipes and describe their own fillings, count out the money that they will need for the pancake ingredients and then make their own. Reading the story aloud to a class can also spark off ideas about other characters that could be included in the story and I made a Mr Wolf’s Pancakes book with a group of children in which fairytale and nursery rhyme characters did help him. It was fun choosing characters for each job – instead of slamming the door in Mr Wolf’s face as he does in Mr Wolf’s Pancakes our Chicken Licken laid eggs for him to use in his recipe! We love this recipe for vegan, gluten free banana pancakes. They taste absolutely delicious! We make the batter using 150g gluten free flour (you can also use plain flour), 300ml soya milk, 2 teaspoons baking powder, a pinch of salt and two very ripe bananas. Whizz all the ingredients up in a food processor before frying the pancakes in sunflower oil. This recipe makes 12 small pancakes. CUTENESS!!! Also, I have a bunch of friends that would love that recipe. It’s a really fun story Frances. With a bit of a twist at the end!! Thank you for the reminder that pancake day is on Tuesday and for linking up with the #MMBC. This sounds like the story of the hen who worked hard to harvest the wheat, grind it etc and nobody would help her, but they all wanted to help eat the bread! Thanks for the reminder that it is pancake day tomorrow! What a lovely book I’m looking forward to our pancakes later. What a lovely story! I’ll have to order this one ready for next year! I do like it when familiar fairytale characters are used in books and their stories developed. This looks like a lovely fun book & readable not only around pancake day! It’s a great story to read throughout the year 🙂 I don’t know of many pancake day stories. The recipe is really yummy! I hope you enjoy the book, I’m not going to give away the ending! This book sounds perfect for tomorrow. The recipe is really tasty 🙂 Enjoy your pancakes tomorrow!